The Secret Life of Mitch Spinach begins in the cafeteria, where Mitch’s classmates are eating the standard American diet of pizza, French fries, and chicken fingers (this is a sad commentary on our schools today, where most cafeterias serve processed junk food). Mitch pulls out his Nutripak, filled with organic fruits, veggies, nuts, and seeds. He mixes it all into his portable blender, and out comes the Mitch Spinach Super Smoothie (but kids should know that you don’t need a portable blender to eat healthy)! Mitch’s super athletic abilities, extraordinary vision and hearing, and brain power—all of which are admired by his classmates at Sunchoke Elementary—are a testament to his healthy diet. Mitch receives a special note from Principal Lycopene requesting Mitch’s help solving a mystery. Someone keeps breaking into the school custodian, Mr. Habanero’s supply closet and making a big mess. Using his keen senses, Mitch solves the mystery! The culprits are a scared mother cat and her kittens, who have taken up residence in the closet. Mr. Habanero ends up adopting the cats. This would’ve been the perfect place to throw in a reference about the companion-animal overpopulation crisis, but understandably, you can’t fit every issue into one book! 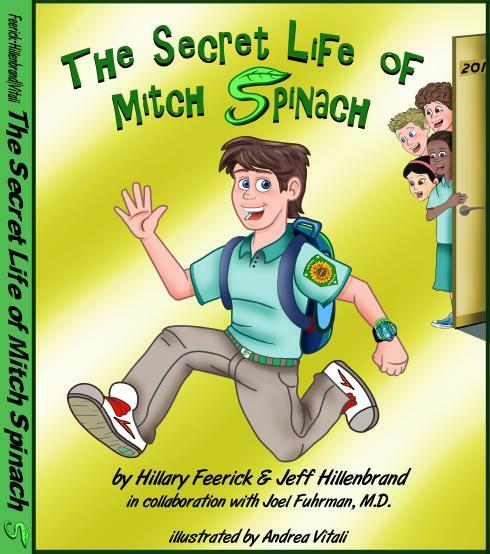 I was impressed by how much was squeezed into this book, including the teaching points in the appendix, which explain the benefits of eating fruits and vegetables, and a recipe for Mitch’s Super Smoothie, which I think kids will be eager to try. It’s a timely story that addresses the benefits of eating healthy in a world that is slowly creeping into the crisis stage of an obesity epidemic. A website accompanies the book. It includes a fan club, games, lesson plans, recipes (all vegan), and merchandise. Let’s hope that there’s a Mitch Spinach craze like there was for Elmo … kids could use a good role model. On another note, I could easily see this story being adapted into a Saturday morning cartoon series. Kids would definitely tune in to watch Mitch Spinach solve a new mystery each week. Perhaps the show can open with Mitch Spinach asking the kids to grab their favorite fruit to snack on while they watch? Sadly, I very much doubt there will be an Elmo-sized push for Mitch Spinach. It simply doesn’t have the marketing millions behind it, and that’s what it takes these days. I got the book for my grandchildren, ages six and eight. They loved it. Imagine a child superhero that eats healthy. After reading the book I made them the smoothie and they enjoyed it. According to my daughter they asked for it every breakfast or lunch since reading the book two weeks ago, and they are eating fruits and vegetables without making unhappy faces. We cannot wait till the next book comes out so they can solve the new mystery with Mitch. We had bought the book last month and let me just say, not only do our kids love it, but this book is educational and insightful for adults. To respond to Steph’s comment, the book is extremely multiculturally sensitive with children and teachers of varied looks and backgrounds making any child find a familiar face. The reviewer doesn’t mention that all the adult characters have food names that are discussed in the teaching points section at the back of the book, i.e. Ms. Radicchio and Mr. Lycopene and Mr. Habanero. The health benefits of each of these “foods” are discussed at greater length. I think the authors have done a fantastic job sharing a desperately needed message that kids need to eat more fruits and vegetables to be smart, strong, and healthy without be preachy or condescending. My kids think it is just a fun adventure/mystery yet they want to be like Mitch Spinach and therefore they are interested in eating the fruits and vegetables mentioned in the book. I too, agree with Steve, I can’t wait till the next book in the series comes out. I wholeheartedly recommend this book to all parents and grandparents.